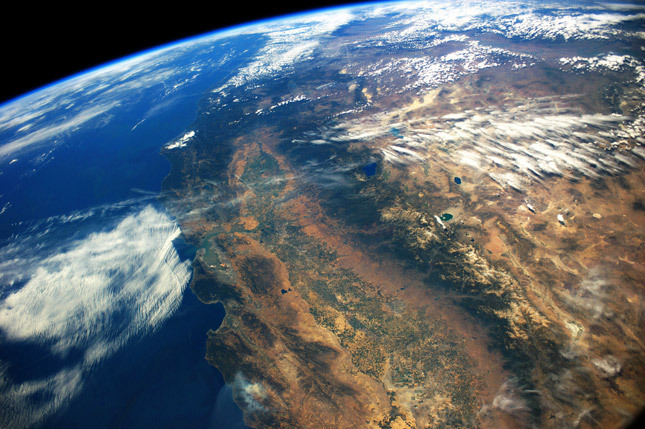 ﻿ Historic Drought Prompts Water Innovation in California – Can It Be a Model? California’s relationship to water is unique in the United States, often becoming a major part of state and local power struggles. But even by those standards, water has become a greater concern in California politics over the past few years, a development that may be a harbinger of things to come for much of the world. With about two-thirds of its precipitation falling in the north and roughly two-thirds of its population residing in the south, California relies on an intricately plumbed network of reservoirs, aqueducts, pipelines, and pumps as well as out-of-state imports to supply many different kinds of water users, including major urban centers, agriculture, and industry. A major earthquake or failure of a dam or levee could have a profound impact on the water supply to regions hundreds of miles away. In addition, both of the two major sources that feed the aqueduct systems, the Colorado River and Northern Sierras, are themselves strained by climate change, causing swings in their annual reliability. As the state works to adapt to changing conditions – including an unexpected and dramatically wet winter that has now pulled most of the state, including my own West Basin Municipal Water District, out of official drought status – California could be a model for the kind of balanced water storage and conveyance systems that other cities, states, and nations are working toward around the world. What lessons have we learned? And what still needs to be done? Prior to the worst drought in its recorded history, California took a fortuitous step. In September 2012, Governor Jerry Brown signed AB 685, a bill that made it the first state in the nation to guarantee universal access to safe water. It declared that “every human being has the right to safe, clean, affordable, and accessible water,” and further solidified the state’s role in leading U.S. water policy. Fast forward to 2014 when the drought’s effects were in full force and increasingly visible to all residents. Governor Brown made the case for conservation and future water sustainability, and under the state legislature forged a bipartisan $7.12-billion statewide water bond that was overwhelmingly approved by voters in November. Another milestone that year was the passage of legislation that required local agencies to establish sustainable groundwater management plans, a bit of catch up as California was the only state in the West that did not mandate the tracking of groundwater use up to that point. The culmination of these events in less than two years set California on an urgent path toward developing new projects and plans to ensure not only water security for today’s users and conditions, but for future users and conditions. Spurred by the drought and climate science that gets better every day, agencies across the state are implementing new techniques and technologies in an effort to diversify supply portfolios so as not to be overly dependent on any one source where possible. The focus now is on resilience and sustainability, and we are looking to other countries, such as Israel and Australia, that have faced similar challenges for lessons learned. One area where local agencies such as the West Basin Municipal Water District, where I have served on the board of directors since 2014, have made great strides is water reuse – recycling treated wastewater for irrigation, industrial use, and groundwater recharge. The drought of the late 1980s and early 1990s led to the development of West Basin’s world-renowned Edward C. Little Water Recycling Facility in Los Angeles County that recycles 35 million gallons of water per day and distributes it through a network of nearly 110 miles of distinctive purple pipes. Where West Basin is unique is that it produces five types of “designer” recycled water that are specific to the needs of its customers. These include golf courses, local municipalities, and office and shopping centers that require irrigation water; oil and gas refineries, which use water to run boilers and convey heat to cooling towers; and residents, whose drinking water we help to protect by recharging aquifers to prevent saltwater intrusion along the coast. The use of recycled water during the 2012-2017 drought helped insulate West Basin from mandated conservation cuts by the state, and allowed our recycled water customers to continue normal operations in the midst of severe drought. Today, we continue testing new recycled water technology that will benefit the entire water industry and are in the process of expanding the plant’s capacity to produce additional recycled water, further improving drought resilience and lowering dependence on imported potable water. California policymakers, businesses, and residents have learned much about water security over the last five years. Indeed, with the announcement that the Trump Administration is withdrawing the United States from the Paris climate accords, sub-national-level actions like those undertaken by California are all the more important. Cape Town, South Africa’s second largest city with a population of nearly 4 million people and a mainstay of the nation’s tourism industry, is experiencing its worst drought in more than a century. Climate change and Cape Town’s rapid population growth have contributed to the crisis, but the city’s nearly sole reliance on surface water dams for its water supply also contributes to its vulnerability. Similarly, São Paulo just emerged from a two-year drought thanks to El Niño rains, but up until recently faced unprecedented water shortages that forced shutdowns and quotas. With a metropolitan population of nearly 20 million people, South America’s largest city depends on rivers and above-ground reservoirs to supply its drinking water and hydroelectricity for its energy. With industry accounting for about 30 percent of water use and experts predicting more droughts in the future, private sector representatives have joined activists in urging government planners to diversify the city’s water supplies. The issues confronting California, Cape Town, São Paulo, and many other communities around the world are not dissimilar and emphasize the need for a new way of looking at water. As we encounter the effects of climate change and growing, more affluent populations, we must develop a more balanced approach to water supply solutions that take into account regional natural assets, such as groundwater basins and seawater desalination, as well as supplemental systems including reservoirs, stormwater capture, and recycled water. Diversifying supplies means not only looking to build new facilities, but spurring consumers to think more comprehensively about how they use water. The costs of inadequate water supplies are steep for today’s highly condensed urban areas and are simply not an option. And, perhaps, we should still pray for rain. Scott Houston is vice president of the board of directors of the West Basin Municipal Water District in greater Los Angeles, California. Sources: The Associated Press, Bloomberg, California Legislature, The Jerusalem Post, Los Angeles Times, News Deeply, NPR, ProPublica, Real Clear Politics, Reuters, SF Gate, Stanford University, West Basin Municipal Water District. 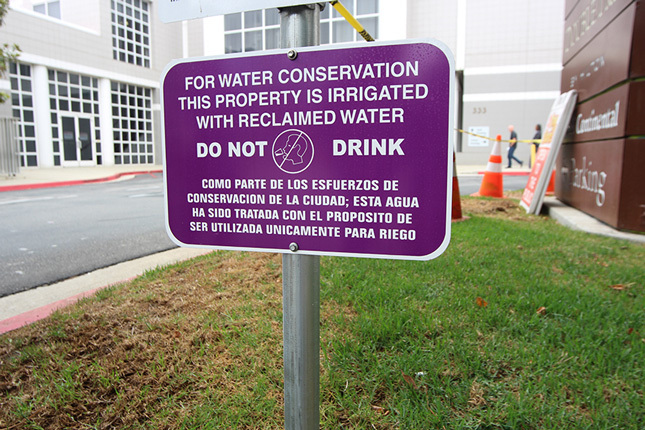 Photo Credits: The Central Valley of California, June 2014, courtesy of flickr user Stuart Rankin and NASA; Irrigated water re-use sign in El Segundo, California, used with permission courtesy of the West Basin Municipal Water District.